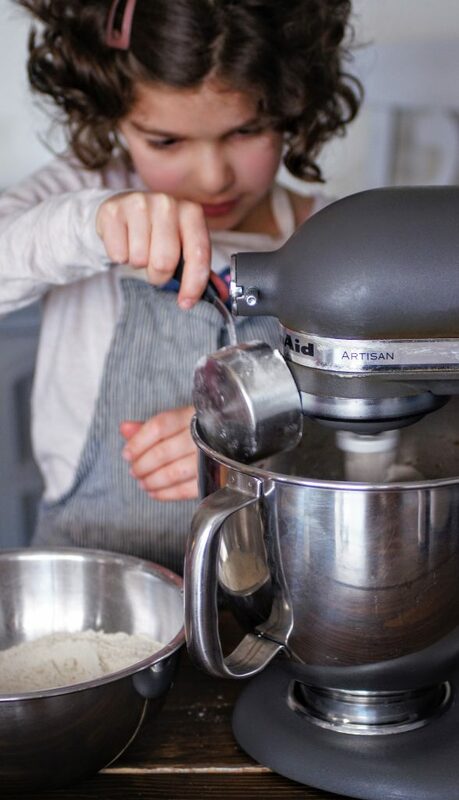 Hi my name is Alessia, I am Cosette’s guest on the blog today. I’m also her daughter. I had ideas on what to write, and I chose to write about chocolate chip cookies. The next day after school, she asked me if I wanted to be her guest in the blog and I said yes. 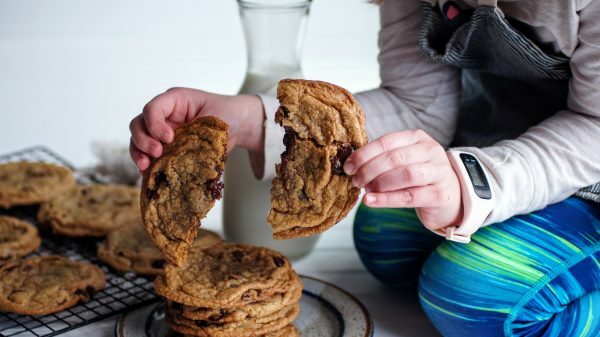 I like chocolate chip cookies because they have chocolate bits in them and when you take a bite you taste chocolate and cookie with butter. You could make it for special events or for fun. I think it is fun to make them with kids. Follow the recipe below and have fun! After many tries and attempts on making chocolate chip cookies adjusting temperature, refrigeration/no refrigeration, various flours...these hailed to be the BEST! Hope you enjoy! Preheat oven to 325 degrees and line 2 cookie sheets with silicone or parchment paper. In a small bowl, combine flours, baking soda and salt. Whisk until combined. 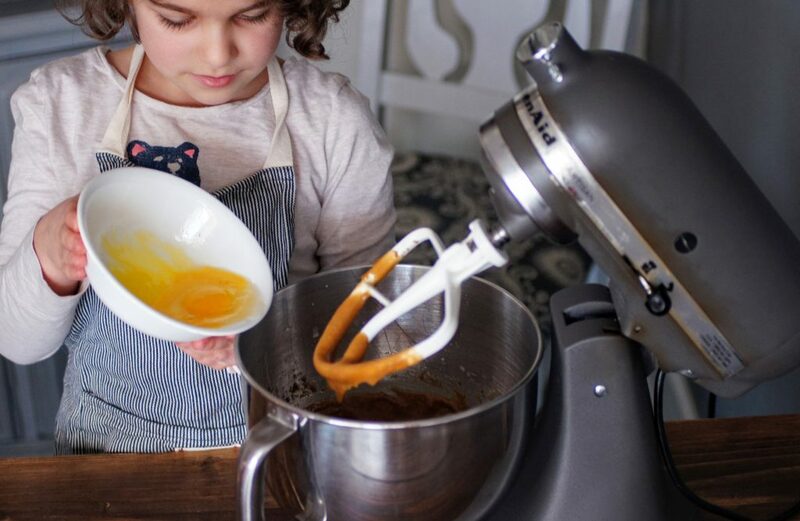 In the bowl of a stand mixer, combine melted butter and sugars. Mix on medium speed for 2-3 minutes until creamed. Add in egg + egg yolk + vanilla and continue to mix for another 2-3 minutes. 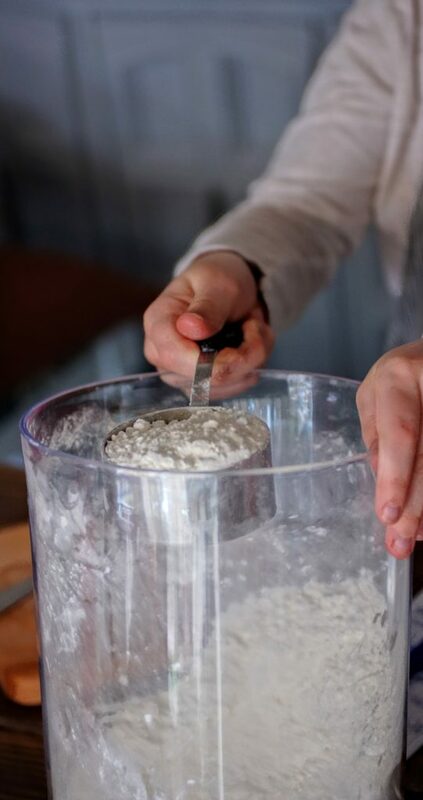 Turn mixer to low and slowly add in flour mixture. Finally add in the chocolate chips. Using a 1/4 cup, scoop dough onto prepared cookie sheets. 5 cookies to a sheet, one in each corner and one in the center. Top with a pinch of finishing salt if you'd like. Bake for 15-18 minutes, until edges are crispy and center is still soft. Remove and let cool on rack. Enjoy! 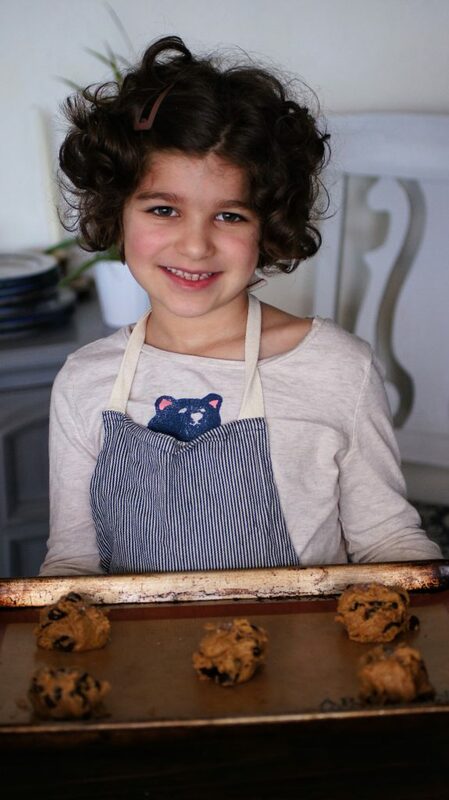 Alessia ~ thank you for doing a wonderful job on the blog and the chocolate chip cookies. 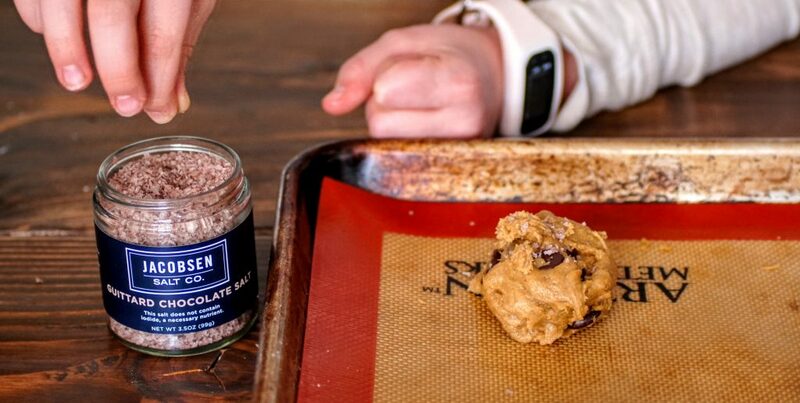 I am looking forward to trying this recipe, as it has some ingredients that I have never used while making cookies; spelt flour and Jacobsen Guittard Chocolate Salt. I hope mine turn out as good as yours. I am looking forward to more post by you. Keep writing, baking and cooking! Thank you! That was my first time using chocolate salt too. I tried my best to make them! I hope you like them! And have success making them with the new ingredients! And I want to be a chef when I grow up so hopefully I will! Thank you so much for this awesome recipe, but most of all thank you for your beautiful smile !!! You look very professional 💕!! Thank you! I hope you try them and like them!I tried as hard as I can to make them! I made them all by myself and mommy told me what to do. I got to put them in the oven all by myself! It makes me happy when people comment like that! Alessia, what a great blog post. 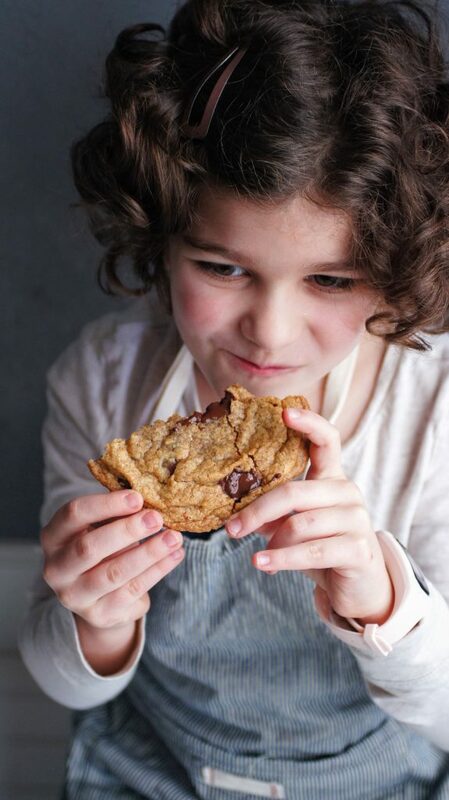 I love that you chose chocolate chip cookies cuz I have struggled making them in the past. I can’t wait to try this recipe. Hope to see more posts from you soon. Thank you!I hope you like them! I could not be more proud of your fantastic writing! You are already a Pro, and we know Mommy is always looking for assistance. I promise I will make these cookies and let you know how it goes. I love you, sweet lady! Thank you!I was so excited when she asked me.I did them all by myself and mommy told me what to do! I got to put it in the oven myself! It was so much fun and it made me happy that people liked it! 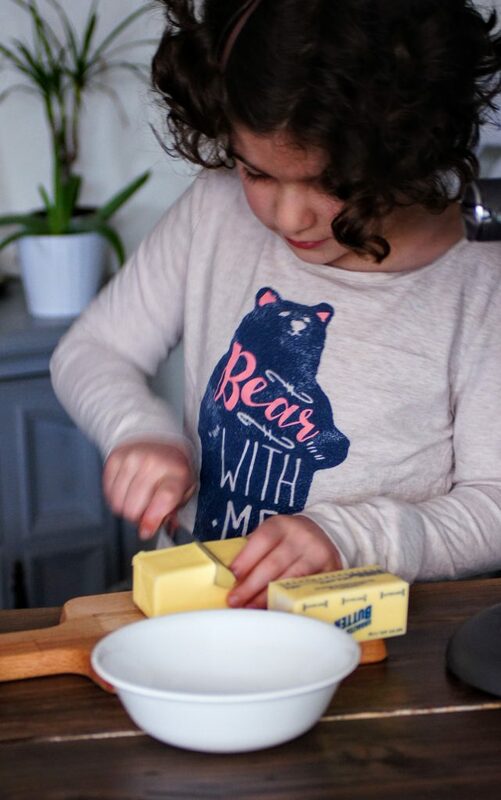 Alessia – Thank you for sharing this recipe. I’m sure my kids will really enjoy making & eating them. Great work little lady! Thank you. I hope you and your kids enjoy the cookies and have fun making them. Hey alessia! These look tooooo yummy! I had a question…what if i dont have spelt flour…? I could buy some but im afraid it would go to waste because i dont think i would need it ever again in the future…have any advice for me? 😀 Thanks! Hi there. You can you regular flour instead of spelt if you don’t have it. It might make the cookies a little crunchier. My mom said the spelt flour gives them a little more chew. Thank you, hope you enjoy. Hi me again! So I tried these (AP flour only) and they are truly 👌🏼Only problem I had was mine wouldn’t flatten but that’s a problem I’ve been having with any choco cookie dough I’ve been making in this oven…I think it might be the oven 😣if anyone knows what I should do plz let me know! Thanks for the recipe! Darn! It may be an oven thing. I would purchase an oven thermometer and test your actual oven temperature to make sure it’s heating properly. Amazon carries them pretty inexpensively. I saw a video not too long ago about how to adjust the knob for your oven if the temperature is off (that’s if it’s not a digital oven setting). That may be a place to start if you’re noticing trouble with other baked goods. So sorry they flattened but glad they still tasted good!!!! Keep me posted. 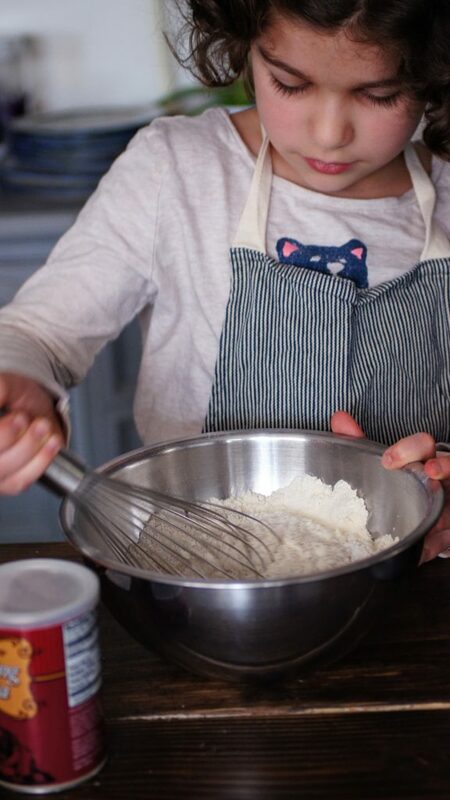 Hi Alyssa, thank u so much for the receipe, I will try them with my grandkids, those boys love making cookies. U look as if u do also. I am definitely going to use the spelt flour to make them crispy. Cannot find guittard chocolate salt. Where can I get it? Not even the Jacobsen Salt Company had it. Thanks for reaching out. You can use another flake salt if Jacobsen’s isn’t in your area. You can also order online. Here is a link. Hope you enjoy! Those look so good! 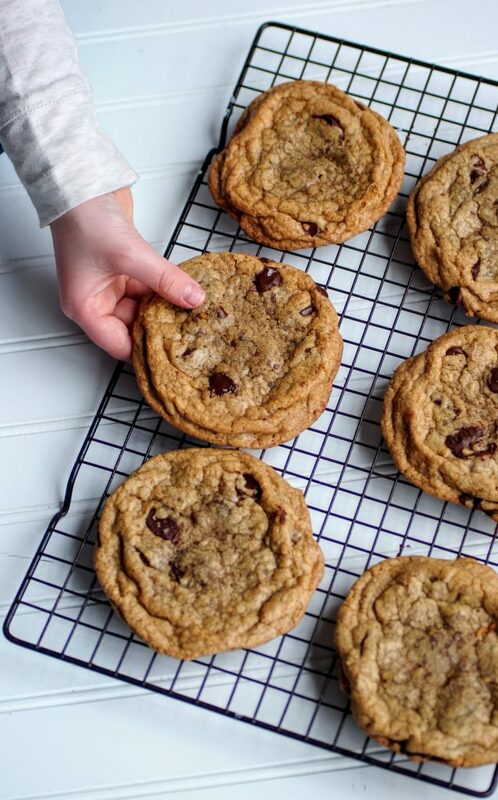 I’m always in search of THE perfect chocolate chip cookie and these will have to be on my to try list. They really look beautiful and so do you! Keep up the good work, you’ll be a great chef. Made the cookies without the spelt flour and they still turned out great! I also sprinkled some sea salt over the top of them before baking. They were very chewy and soft! Great recipe and I would definitely would recommend it. That is wonderful, thanks for the feedback. Glad you enjoyed! can this recipe be make with gluten free and come out soft and crewy? I just baked a batch and they are awesome!!! Great recipe. Ni hao Alyssa! I made these this weekend and they turned out awful! 🙂 Do you know why? Because I live now live Guangzhou, China. LOL. (I usually live in Portland). Here’s the story. I reached in my cupboard for brown sugar and found out my bag of brown sugar had gone bad. It had actually gone moldy. Something I’ve never seen before. So I walked across the street to a very small store and bought a new package of brown sugar. When I got home I opened the brown sugar only to discover the sugar was very, very dark. Did you know there are different types of brown sugar? The sugar also hard lots of small very hard pieces in it. I decided to continue anyways. I just had to have your chocolate chip cookies! Well, the cookies came out of the oven beautifully. Some of the best looking cookies I’ve ever made. They were dark – almost looked like ginger snaps. But they were gorgeous. And I could tell they had nice firm edges and soft chewy middles. But they looked like they had toffee bits in them. I gave them a bite. Yuck! They were not good. The “toffees” were actually melted pieces of hard brown sugar. And the extra dark brown sugar just didn’t work. But they looked so good. And I have a craving for your cookies that I still must satisfy. So I’m now searching the city for good brown sugar. I went to three stores yesterday. No luck. It can be a bit hard to find certain ingredients here in Guangzhou. But I am now on a mission. I’m going to search and search. And try again. Because your recipe looks amazing! I’ll send you a picture when I find good brown sugar. 🙂 Zai jian. So sorry to hear of your troubles with the cookies. Getting ingredients overseas sometimes can be difficult. Seems like your problem was definitely the brown sugar, probably older hence the lumps. You can certainly use light brown sugar if that is easier to find. If you notice clumps in your brown sugar, you can microwave your portion with a damp paper towel on top for about 20 seconds. That will help soften it and get rid of those clumps. Let me know how it goes, thanks for sharing! I also live overseas in an area where ingredients can be challenging to find. You can make your own brown sugar by mixing molasses into your white sugar. This also allows for you to get the darkness you desire. Hopefully that will help! I have never heard of spelt flour what is it? Btw your daughter is quite beautiful you are blessed. I just made these and I followed the recipe (I often don’t!) except I used light brown sugar instead of dark because that is what I had. My cookies did not spread out like the photographs . After the first pan, I pressed the cookie balls down some, but they really didn’t spread then either. I can’t imagine the difference between light and dark brown sugar would affect that. Any ideas? Thank you! I’m sorry they didn’t spread like the photo. The light and brown sugar shouldn’t have made much of a difference. Dark brown just has more molasses so tends to be a bit richer. Perhaps too much flour, I generally spoon my flour into my cup or fluff well then scoop and level. If there is too much by scooping and more of a packed cup it could make the cookies denser. Oven temperature can also play a factor or the type of cookie sheet, darker trays often don’t allow spreading as much. So sorry, I hope they still taste good even without the full spread. Let me know if you try another time. Thanks for checking in. I can not find the chocolate salt online; any idea where to get it. So sorry for the delay, looks like Williams Sonoma has in their dessert trio pack right now. If you can’t find it, any good flake salt to top would be perfect!! 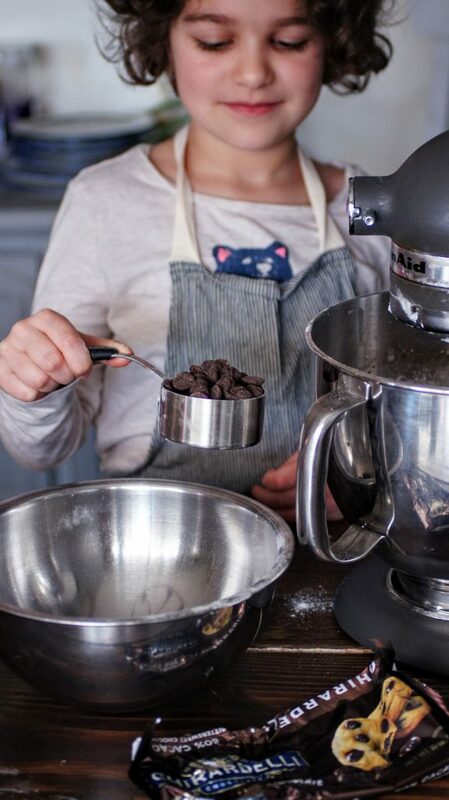 Love the idea of chocolate salt…next visit to the spice store. I have a couple thing I do in my cookies you might experiment with. I use bread flour instead of AP for more chew and I brown my butter and reconstitute it for a rich nutty flavor. Mmmmmm…all sounds incredible! I have a brown butter cookie on the blog too. Sometimes I just take the extra step but brown butter is basically heaven, am I right? I’ll have to try bread flour, I do use spelt flour quite a bit which I love. Thanks for the sweet tips. I made these today. They are so good! This will be my go to chocolate chip recipe. I can’t stop eating them. Yay!!!! Makes me so happy to hear. Thanks for sharing your comment. I used whole wheat flour in place of spelt flour ,coconut sugar in place of dark brown sugar,semi sweet choco chips in place of dark chocolate chips . Mine didn’t spread like hers ,but were great ! Yay! So happy to hear they turned out great with the substitutions! Thanks for sharing.